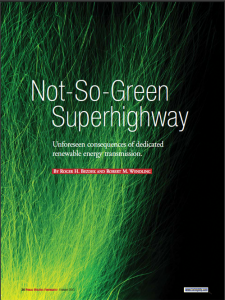 Published in the February, 2012 issue of Public Utilities Fortnightly, Bezdek and Wendling’s delves into the taboo subject of whether so-called green energy can compete against other, far more reliable and far less expensive energy resources without strict mandates. Bezdek and Wendling consider the widespread resistance to new transmission that is required to service the renewable energy being mandated by various federal and state Renewable Energy Standards (RES). They argue that the numerous permits and approvals for these new transmissions lines would require a heavy federal government presence and the widespread use of eminent domain, which would necessarily bring on substantial political controversy and resistance from an increasingly combative electorate. They also diverge from traditional discussions on renewable energy by openly admitting there are serious drawbacks with these renewable-based transmission plans. First, they admit that renewable requires the concurrent construction of matching backup power resources, and that the costs for that backup power will be charged directly to power consumers. In some instances, as much as a 5.7 cents per kWh surcharge has been added to the average annual price of 9.8 cents per kWh to address the need for spinning backup. In some areas, the surcharge effectively doubles the cost of electricity for consumers, given the cost of coal-fueled electricity is approximately 4 to 6 cents per kWh. If these new lines are opened to, or required to be opened to, all forms of generation, far less expensive and far more reliable forms of generation, such as coal-fueled electricity, would quickly become the primary users of the new lines. Coal-fueled plants typically have capacity factors of 85 percent and above, while average renewable capacities are around 30 percent (in premium locations). 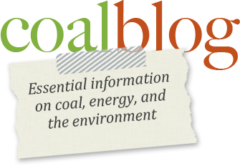 Bezdek and Wendling analyze two possible scenarios where improved access to new transmission rapidly increases demand for coal-fueled generation. In these scenarios, coal demand across the nation could grow by 25 to 150 million tons annually, due to increased utilization of existing coal-fueled capacity (i.e. without the construction of any new coal plants). This new coal-based generation would be priced at rates 3 to 15 times lower than competing renewable generation. Capping off their discussion, Bezdek and Wendling suggest that, where renewable and backup generation are constructed, there would be extreme cost pressures to use backup generation – typically gas-fired – over the renewable energy. Simply put, renewable energy cannot compete on a cost basis with gas-based generation either and electricity users would be likely to push for the less expensive (backup) option. Whether competing against coal or gas, renewable energy’s high cost, inherent variability, and low capacity factor would quickly force it out of the mix, unless stringent legal/regulatory requirements force it to remain. Bezdek and Wendling note that those requirements will bring on strong resistance from ratepayers and industrial electricity users.